During the Spring and Autumn Period (771 to 476 B.C. ), there was a city famous for its commercialism called Tao Yi. 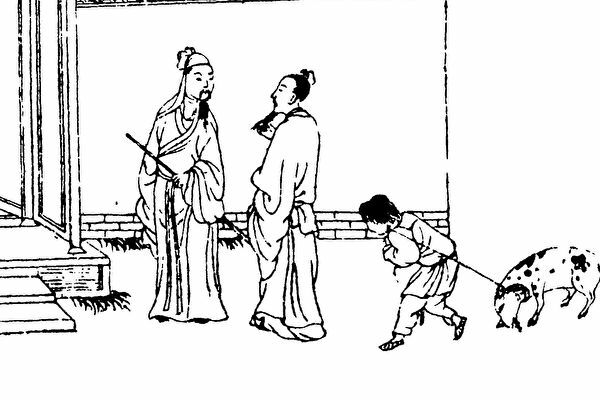 Sima Qian, in his Records of the Grand Historian, described Tao Yi as located in the center of the world, where rich people were everywhere, and the movement of goods was in a strategic position. An official named Dazi governed Tao Yi for three years, but failed to make any notable achievements for his people. On the contrary, his reputation was bad and his personal wealth grew exponentially during his tenure of service. The wealth that he accumulated could not be accounted for and his wife repeatedly advised him, but her warnings fell on deaf ears. Dazi retired from his post and returned to his hometown with 100 carts loaded with treasures. Relatives and friends slaughtered cows to celebrate his return, except for Dazi’s wife, who was crying uncontrollably. “My husband has no great abilities, yet he held a high official position. When he was governing Tao Yi, he did not bring any benefit to the city, but he became extremely wealthy. Yin Ziwen of Chu State governed the region before him and it became very rich while he remained very poor. The people loved him and the merits that he accumulated were passed down to future generations, and his name was recorded in history. My husband is not the same; he is greedy and does not care about his future. This will surely bring disaster. “I heard that there are black leopards in Nanshan. When it rains they would rather go hungry for several days and will not hunt for food. Why is that? It is because they want to preserve their shiny fur and its colorful pattern; they are not greedy for tasty food to avoid hurting themselves; they hide their tracks and avoid disaster. After hearing this, the mother-in-law was furious and chased the virtuous daughter-in-law out of the house. In less than a year, Dazi was found guilty of corruption and was executed. His family was broken, leaving behind the lonely old woman to bear the pain of losing her son. When Dazi’s wife heard about her husband’s tragedy, she returned with her child and cared for her mother-in-law until her death. Later generations of the family complimented Dazi’s wife for her wisdom to forego wealth and to uphold morality.